Seki, a Japanese go term adopted into English, means mutual life. In its simplest form, it is a sort of symbiosis where two live groups share liberties which neither of them can fill without dying. Below you will find several types of seki. Be aware that although neither side can 'win' a seki, a seki can be a possible source of ko threats. There are also scoring issues in seki. The simplest form of a seki is shown in this diagram: the and groups have no eyes and share two liberties at a and b. If either player plays on one of these points, the opponent will play the other and capture. So neither player will. If Black nevertheless plays at , White will capture the bulky five with . Similar, if White starts at , Black will capture the farmer's hat at . Though playing first locally fails, it can be used as a big ko threat, losing points however. A slightly more complex variant is formed by the marked groups. Both have one eye and they share one liberty (at a). Again, if either player plays at a, the other will capture. Both white groups have one eye (at a and b). The black group has none, but shares a liberty with each white group. Again, since no player can capture any stones of the other player, the position is seki. The false eye at b would count in Chinese scoring, but not in Japanese (regardless of being false or not). Stone scoring does not count it either, because White depends on it. The only play which doesn't immediately lose the corner, is White at a. 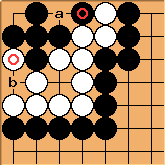 However, that costs one point in gote (RP: only under Japanese rules), as Black captures at b and White must recreate the original position by recapturing at . This is an example of sending two returning one. Also note that under very rare circumstances, in this kind of position White can use the superko rule to capture the black stones in some rulesets. See Rules Beast 1. Playing at is a serious mistake: White now is dead (a dead pyramid-four eye shape), without any further move of Black. White shouldn't play at c either: She would put her big group into self-atari, letting Black capture it at . Here b is a real eye. This is no seki since White is able to capture Black. Both a and b are (false) eyes, which would count in Chinese (and de facto Internet) rules, but not in Japanese scoring (regardless of being false or not). Stone scoring is in-between: It would let White only count one eye (as much she can afford to fill). Note again that in some rulesets this may not be seki under rare circumstances, depending upon how its superko rule treats sending two returning one. Another type of seki. Black can capture the three white stones, but if he does, White will come back at (nakade), leaving Black with a dead shape, so Black won't do so. Likewise, if White were to try to capture Black, she would at some point need to play another stone inside Black's eye space. However, Black would then happily capture four stones and be left with a live straight-four eye space. 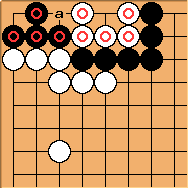 Therefore, neither side wants to play here and this position will remain until the end, with the three white stones and the black group surrounding them alive through seki. When scored, the black group gets zero points. This is an interesting seki involving double ko. 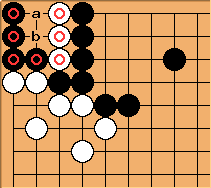 If White captures at a, Black will capture at b. Later, if White recaptures at , Black recapture at , returning to the original position. Similar if Black starts. See double ko and seki with eyes question 1 for more. Black has a string in atari, White two, but for either side, capturing starts a capturing race that the other side can win (see hanezeki). Best play is to leave this, therefore it's seki. In the 4-move (3-move?) 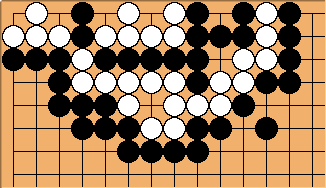 cycle sending two returning one, Black plays two stones, White only one. With territory rules, this costs Black one point. After some (finite) number of cycles have been played, White could simply admit Black's claim that the white group is dead, and still have enough points to win. So Black does not start the cycle. Chris L After one cycle the board position will have been recreated. Is this not prohibited by some form of ko rule? chrisg I'd be interested if someone could add a reference to a page explaining if this isn't a seki, and under what rules. El Draco With the positional superko rule, it would be prohibited to complete a cycle [as Black's recapture would do], but with situational superko, after one [such "]cycle["] it's White's move instead of Black's [and therefore not yet a cycle under those rules]. If [s]he plays somewhere else, Black can try playing there again, with the same result. If, at some point, White passes and Black tries playing again, he may not move again at a1 if White passes again, since that would be prohibited by either superko rule. There is one devious way Black could play however, which is playing a ko threat right after White captures the two stones. After this [and her answer and his recapture)], White can't pass, lest Black plays a1 again and White may not capture the two stones without repeating a previous position with same player to move. This way, Black could win if he has more ko threats than White has moves to play. If White plays [in her or] in Black's territory just to not-pass, Black must pass [if he ran out of ko threats] and it wouldn't have cost either player a point. If White has no legal (or plain dumb) moves left however at some point, and Black has at least one ko threat, Black can win. But you are not alone. I think Frank Janssen was the first to have that idea in the '90s. See Rules Beast 1. Correct, but nevertheless positional superko can be exploited with the same trick. Shouldn't he prepare for the ko fight instead of repeatedly sending two? Black could drop stones into her territory (of no expense as we're assuming area rules). Since she can't expect him to agree on them being dead, she has to capture those she can't afford to stay, wasting precious plays for the ko fight to come. Similar to no-pass Go, his drops also should destroy her eye shape to bring down the number of eyes she can form. Black should also divide his territories to prevent her to drop in later. On her part, she should remove as much of his ko threats as possible. Well, assuming Black didn't start the cycle before her first pass (otherwise considering the second pass makes no sense), already his recapture at a2 (right before her second pass) returns before her first pass and therefore is forbidden. So Black plays the ko threat instead, as correctly follows. Seems to be true if his ko threats are unremovable. After each of her plays she again is able to complete the cycle with a pass (she won't waste another play). Then Black has to spent another ko threat (after his atari and her capture) to spoil that ability again, just as he did after her first pass. But now imagine her two-point vital eye he could drop a stone into, threatening it. Since she could prevent that by a drop of herself, that's one move versus one threat. Nevertheless he will win if he starts. Sekis can be very complex. Here is an example containing two black and three white strings. Robert Pauli: Disagree. That's no single complex seki, that's one seki (two eyes versus none) touching another (one eye each). Being neighbour of a seki isn't being part of it, even if the neighbour happens to be part of another seki itself. That's nothing compared to the seki Harry Fearnley found (see hanezeki). The Japanese Rules say that "eyes in seki" are not counted as territory. This may sound like a stupid question, but what does that refer to? Are all eyes of the groups living in seki ignored, or just the shared eyes? Are the circled points counted as territory for White? According to Japanese rules they are not, but according to Chinese rules they are. Benjamin Geiger: If I understand correctly, each group living in seki can have one eye. Charles Matthews This diagram can become a permanent seki if the central white group can get two eyes. If not, it is a temporary seki. Annodomini: Under Chinese Rules, and other area-scoring rulesets (AGA, New Zealand, Ing I believe), points in Seki do count. This is something to watch out for, because the results differ in Japanese rules and area-scoring rules. A player can capture the opponents stones but if he does this group is left with only one eye. and dies because he has only one. the first reason is the most common one, in all sekis it applies (or will later apply) to at least one of the players. All the examples on this page fit this description. sometimes both players fall under the atari case, sometimes it is for one the atari case and the other the eye case. Different Japanese rules describe seki differently. The Japanese 1989 Rules do not define seki but define stones to be in seki if they have dame (where, informally, dame are points that aren't inside eyes). If a player requests resumption of a stopped game, his opponent must oblige and has the right to play first. So if your opponent tells you (rightly) that one of your groups is in seki, you can just resume play. Your opponent plays first, but of course can pass. Both groups in a capturing race have only one liberty left. Both players are on their last byo-yomi period or face sudden death. Both groups are too large to be picked up within the remaining time. This means that neither player will initiate, as they would otherwise lose on time, and thus is a seki. A way of avoiding time sekis is to allow the captor to require their opponent to remove the captives in their own time. A recapture under the stones, although something conceivable here, is not possible in this case; it isn't an idea that has much interaction with seki. Bill: While Charles has a point, the usual assumption that outer stones in a diagram are alive applies. Also, there is a slight inaccuracy. 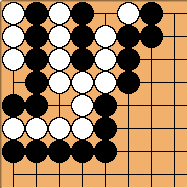 White's outer group does not need two eyes to preserve the seki. isd: Whether this request would be accepted by a referee has not yet been tested. RobertJasiek: I could tell something about how it has been tested, etc., but this is off-topic. isd: If it has been tested in Japan I would be interested in hearing about it, if it has not been tested in Japan I would be disinterested. RobertJasiek: According to the official J1989 commentary, dame adjacent to ordinary groups create in-seki. isd: What I am asking is has a Japanese referee ever had to make a ruling on this situation. I am not asking about the content of these rules. RobertJasiek: IIRC, yes, but I do not recall details by heart. Besides, Sakai Takeshi (the major J1989 author) has confirmed this interpretation clearly. He regrets to have created rules with that side-effect but confirms that such are the current rules.